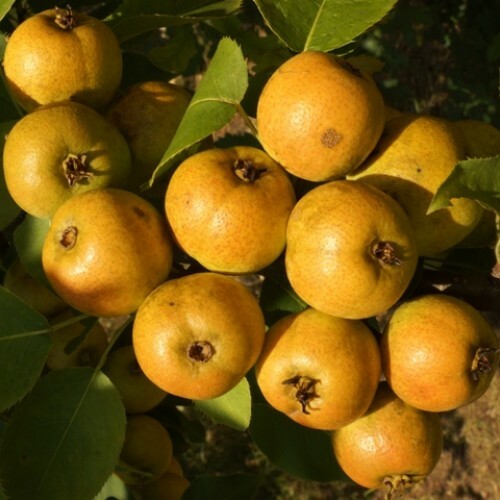 This strain of Asian pear comes from Mt. Wolchulsan in South Korea. This non-grafted strain produces small, tart fruit that can be made into juice, jam, or even cider. Recently, a study compleated by CISRO, an Austrailian research organization, found that drinking the juice of the pear reduced hangover severity by 21 percent. This study followed a group of studies with similar findings. You won't find these pears in the supermarket, so growing your own wild pear is the way to go. To store the seeds cold store them in the refrigerator. To germinate fall plant outside 1/4 inch deep with seeds 1/2 inch apart. Germination will be begin in early spring. For germinating in the refrigerator, store in a lightly moist Canadian peat moss for 90-120 days. Do not freeze. Some sprouting will occur in the refrigerator after 70 days upon which you should pick them out and put them in a pot. Use light aerated soil mix to avoid root rot.